Dr Rachel Boyd (Osteopath) is a highly skilled osteopath whose caring nature is evident in her approach towards each patient. Rachel obtained her Bachelor of Clinical Science and Masters in Osteopathy from Victoria University and has a special interest in the treatment and management of acute and chronic spinal pain. Rachel grew up in the local suburbs of Bayside and has a background playing a number of sports including netball, tennis, running and skiing which has provided Rachel with the knowledge and skill in treating a wide range of sporting conditions. Rachel treats a wide variety of people including desk workers, the elderly, athletes and more. Rachel caters her osteopathy treatments specifically to the individual. Her core focus is on patient outcome and to help each patient achieve and maintain good health and fitness. Rachel is passionate about equipping her patients with the knowledge and strategies needed so they can play an active role within their own health and to achieve the best results possible. 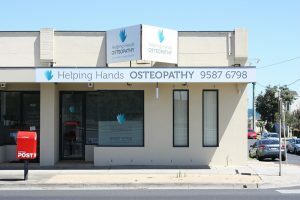 If you’d like to make an appointment to see Dr Rachel Boyd at Helping Hands Osteopathy, call (03) 9587 6798 or Book online via our website or the Helping Hands Osteopathy Facebook page.